Trump's North Korea Policy: Is It Different from Obama's? FILE - Undated photo released by North Korea's Korean Central News Agency via KNS on March 7, 2017, shows the launch of four ballistic missiles by the Korean People's Army during a military drill at an undisclosed location in North Korea. Now that the Trump administration has vowed its North Korea policy will differ from its predecessor's, the question is how it will chart a new course, U.S. experts say. U.S. Secretary of State Rex Tillerson declared a departure from former President Barack Obama's containment policy of "strategic patience," which many viewed as a failure because it did not curtail North Korea's nuclear weapons programs. "The policy of strategic patience has ended," Tillerson told reporters in South Korea this month while on his first official East Asia tour. "We are exploring a new range of diplomatic, security and economic measures." Although Trump's White House is reviewing policy options for the unruly regime, Tillerson laid out the precepts for how the U.S. would cope with the North — no negotiations unless North Korean leader Kim Jong Un commits to denuclearization of the Korean Peninsula, and a willingness to take pre-emptive military action if necessary. 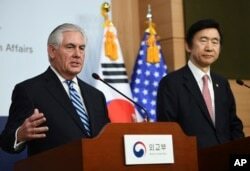 FILE - U.S. Secretary of State Rex Tillerson, left, speaks as South Korean Foreign Minister Yun Byung-se looks on during a press conference in Seoul, March 17, 2017. Thomas Countryman, who served as assistant secretary of state for international security and nonproliferation in the Obama administration, believes the secretary's tough rhetoric notwithstanding, Trump's North Korea policy is not very different from that of his predecessor. "The Trump administration is very much on the same path as the Obama administration, putting greater emphasis on sanctions, putting greater emphasis on the need to provide defensive and deterrence capabilities to protect Japan and South Korea," he said. "Tillerson said military options are under consideration, and that is not substantially different from what President Obama always said, that 'all options are on the table,' " Countryman added. But Trump appears to be shunning "effective engagement with China, which remains the key," the former diplomat said. The Trump administration has called out Beijing several times for failing to provide sufficient support in containing Pyongyang's nuclear ambitions. While Tillerson was in Asia, the president tweeted, "North Korea is behaving very badly. They have been 'playing' the United States for years. China has done little to help!" Trump is expected to host Chinese President Xi Jinping for a two-day summit next month, and North Korea is likely to top the agenda. Ken Gause, director of the International Affairs Group at the Center for Naval Analyses, maintains that strategies outlined by the Trump team are no different from Obama's failed approach, and he expects Trump's policy for North Korea has the same chance of success. FILE - U.S. President Barack Obama, left, points towards North Korea from Observation Post Ouellette in the Demilitarized Zone, the tense military border between the two Koreas, in Panmunjom, South Korea, March 25, 2012. "You are basically going to get North Korea, [which] will continue to do what it does, or to continue to lump more sanctions and pressure on North Korea [and] try to pressure China in solving the problem before us as the Obama administration did," Gause said. "It won't solve the problem." Still, other experts believe Trump will stake out different strategies to denuclearize North Korea, and they expect Trump to adopt a harder-line policy that centers on tightening the financial noose around the isolated state's nuclear and missile programs. A former CIA deputy division chief for Korea, Bruce Klingner, said that although it is premature to draw conclusions, with the Trump administration's policy for the North still being defined, "there may be differences in how strongly sanctions are implemented." "Obama talked a good game on sanctions, calling North Korea the most heavily sanctioned and the most cut-off nation on Earth, and he was flat-out wrong," said Klingner, who is now at the Heritage Foundation's Asian Studies Center. "The U.S., the U.N. and the EU did far more to Iran than to North Korea, and it was only last year that the U.S., under the Obama administration, cumulatively sanctioned as many North Korean entities as those of Zimbabwe." 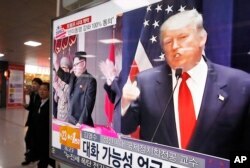 FILE - A TV screen shows pictures of U.S. President-elect Donald Trump, right, and North Korean leader Kim Jong Un, at the Seoul Railway Station in Seoul, South Korea, Nov. 10, 2016. When it comes to sanctioning Chinese individuals and businesses that facilitated North Korea's nuclear development, Klingner said the Obama administration was "pulling its punches." He noted Trump can vigorously use U.S. laws to wean Chinese banks and businesses away from engaging the Kim regime. "It only finally sanctioned a handful of Chinese entities for violating U.S. law last year, but only because it was required to do so under the new congressional law," said the former intelligence official, in reference to the North Korea Sanctions Policy and Enhancement Act, which Obama signed in February 2016. Sung-Yoon Lee, a North Korea expert at Tufts University's Fletcher School of Law and Diplomacy, said the Trump administration appears to have "a growing awareness that the old ways of doing things will not only not work, but invite a bigger calamity." "The era of half-measures, procrastination, on-and-off half-party diplomacy, half-party sanctions is now over, and we have entered a period of consequences," the professor said. "There's a consensus in Washington … there's a lot more that the U.S. could and should do to financially squeeze North Korea — to toughen up on sanctions against North Korea and also to go after North Korea's third-country partners." Pyongyang's official Rodong Sinmun newspaper has denounced Trump's North Korea policy, saying that "no big differences are found between Obama's ruptured 'strategic patience' policy and the incumbent U.S. administration's [North Korea] policy." Baik Sungwon contributed to this story, which was first reported by VOA's Korean service.